Charles Melvin "Cootie" Williams (July 10, 1911 – September 15, 1985) was an American jazz, jump blues, and rhythm and blues trumpeter. Born in Mobile, Alabama, Williams began his professional career at the age of fourteen with the Young Family band, which included saxophonist Lester Young. According to Williams he acquired his nickname as a boy when his father took him to a band concert. When it was over his father asked him what he'd heard and he replied, "Cootie, cootie, cootie." In 1928, he made his first recordings with pianist James P. Johnson in New York, where he also worked briefly in the bands of Chick Webb and Fletcher Henderson. He rose to prominence as a member of Duke Ellington's orchestra when the band was playing at the Cotton Club, with which he first performed from 1929 to 1940. He also recorded his own sessions during this time, both freelance and with other Ellington sidemen. 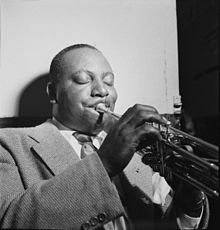 Williams was renowned for his "jungle" style trumpet playing (in the manner of Ellington's earlier trumpeter Bubber Miley and trombonist Joe "Tricky Sam" Nanton) and for his use of the plunger mute. He also sang occasionally, a notable example being in the Ellington piece, "Echoes of the Jungle". For him, Duke Ellington wrote ''Concerto for Cootie,'' which when lyrics were added became "Do Nothing till You Hear from Me". He was also the soloist in other major Ellington compositions like ''Echoes of Harlem'', "Harlem Air Shaft", and the religious piece ''The Shepherd Who Watches Over the Night Flock,'' which was dedicated to the Rev. John Gensel. In 1940 he joined Benny Goodman's orchestra, a highly publicized move that caused quite a stir at the time (commemorated by Raymond Scott with the song "When Cootie Left the Duke"), then in 1941 formed his own orchestra, in which over the years he employed Charlie Parker, Eddie "Lockjaw" Davis, Bud Powell, Eddie Vinson, and other young players. In 1947, Williams wrote the song "Cowpox Boogie" while recuperating from a bout with smallpox. He contracted the disease from a vaccination he insisted all band members receive. By the late 1940s Williams had fallen into obscurity, having had to reduce his band numbers and finally to disband. In the 1950s, he began to play more rhythm and blues, toured with small groups, and played in the Savoy Ballroom. In the late 1950s he formed a small jazz group and recorded a number of albums with Rex Stewart, as well as his own album, Cootie in Hi-Fi (1958). In 1962, he rejoined Ellington and stayed with the orchestra until 1974, after Ellington's death. In 1975, he performed during the Super Bowl IX halftime show. He was a 1991 inductee of the Alabama Jazz Hall of Fame. Williams died in New York on September 15, 1985, at age 74 from a kidney ailment. He is interred in Woodlawn Cemetery in The Bronx, New York City. ^ Du Noyer, Paul (2003). The Illustrated Encyclopedia of Music (1st ed.). Fulham, London, UK: Flame Tree Publishing. p. 181. ISBN 1-904041-96-5. ^ a b c d e f Robinson, J. Bradford (1994). "Williams, Cootie". In Kernfeld, Barry (ed.). The New Grove Dictionary of Jazz. New York, New York: St. Martin's Press. p. 1290. ^ Curtis, Constance; Herndon, Cholie (April 30, 1949). "Know your Boroughs Orchestra Men Talk About Show Business". The New York Amsterdam News. p. 15. ^ a b Fraser, C. Gerald (16 September 1985). "Cootie Williams, Ellington Trumpeter, Dead". The New York Times. Retrieved 1 December 2016. ^ Visser, Joop (2001). "Disc Four - Take the A-Train". Duke Ellington - Masterpieces 1926-1949 (CD booklet). Duke Ellington. England: Proper. pp. 39–52. PROPERBOX 25. ^ a b Schenker, Anatol (1995). Cootie Williams and His Orchestra 1941–1944 (CD booklet). Cootie Williams. France: Classics. pp. 3–8. CLASSICS 827. ^ "The Laugh is on Maestro Cootie". The Afro American. May 3, 1947. Retrieved November 28, 2010. ^ "Alabama Jazz Hall of Fame Inductees". Jazzhall.com. Retrieved 2015-12-25.